awww Match sounds like a cutie pie But also feisty I like! Match looks just like Snow! He really inherited his father's looks I must say. I hope his show career is just as successful as his too He's sure to catch everyone's attention in the show ring being that handsome. I'm so glad to see you back Mandy! @Christina-Lindblad @Nina-Ricchi @Neeve-Kalford @Constantine-Vale @Kira-Simpson @Jade-Nguyen Thank you so much, lovelies, I really appreciate your sweet words, and I'm sure Match does, too! @Frida-Radtke FRIDA I tried reaching you on Slack several times! Glad to be back, hope to chat soon! Mandy! This blog is amazing! Your editing style is flawless! Your horses are stunning! Ugh I just love this blog! Look forward to seeing more outstanding pictures! @Jasmine-Wilkinson Thank you so much, sweetie, I try my best! We can stay assured that our horses are always in good and caring hands when we have such excellent staff to keep an eye on them all. Julianna Levitt has worked here for five years now and she has a strict routine for the daily care of the horses. Her role at SSE is mainly general staff, but she also functions as a flat rider on a daily basis. She enters a competition class or two from time to time, but what she enjoys the most is the everyday grooming and caring for Mandy's jumpers. This photo was taken back when we leased "LMEC Calippo" (LMEC Cadre Noir x LMEC Empress), to the left in this photo, from @Christina-Lindblad - a dark bay Danish Warmblood stallion that did very well with Mandy in competition. He has since then returned to his home and still does well in shows. We own his dam "LMEC Empress" and she is to be used within our breeding program after she is retired from sport. In this photo you can see "CDC Eminent" (SSE Old Navy x LEC Elusive Embrace), a bay Hanoverian stallion bred for us by our dear friend Erin Ward. 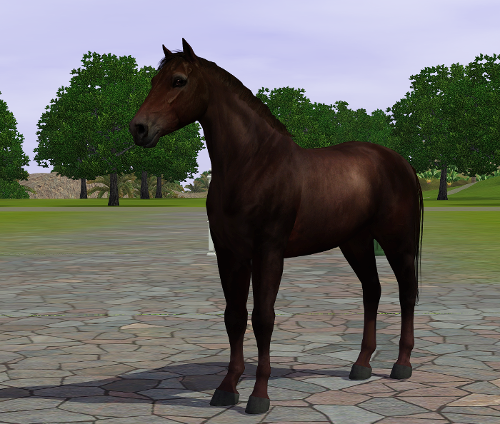 He is grandson to our esteemed stallion "SSE Winter Is Coming". Eminent has an amazing work ethic and he feels fantastic in the competition ring, but he can be quite annoying on a daily basis. He never stands still, he always tries to distract Julianna when she does her daily routine with him, and he whinnies so loud that you wish you had covered your ears before he started. Luckily for Julianna, Eminent kept himself occupied with biting on the cross ties while she hurried with putting on his hoof oil. She has also discovered that binding his tail up in a knot prevents him from swishing his tail in her face while grooming him. "SSE Zinober" (Howler HF x SSE Femme Fatale), our handsome grey NWB in the foreground, is also quite the annoying brat from time to time, and he was waiting quite impatiently for Julianna to put him in his box as he knew that feeding time was just around the corner. Zinober is one of our most promising prospects - he came home with a win in L9 in the recent R-show, and this ain't the first time he has done so. We cannot wait to see what the future holds for these guys! Calle!!! I'm so happy over that you could take him for so long time and help him to grow and develope to the gorgeous stallion that he's today. I have followed him in every show he entried and it's so fun to see the results of your hard work with him and I appreciate it SO much that you could help me with him <3 Now here at home with us, he have settled down really well and have managed to level up to Grand Prix and he actually won his debute in this class, what a boy! Zinobar his coat is getting so light! How could you call that sweet face annoying he could happily come to Heatherwood and annoy me all he wants haha.